Concorso Italiano – On August 19th, yet again Concorso Italiano will pull out all the stops with the likes of the 1967 Alfa Romeo GTV, 1963 Ferrari 250 GT Lusso, Ferrari 330 GT 2 + 2, Lamborghini LP-640 Murcielago Roadster, 1961 Maserati 3500 GT, and other ethereal Italian spectacles that will grace the Black Horse Golf Course (an aptly named course for this event). For big-time Italian automotive fans, this will surely be the event to attend, especially honoring the 70th Anniversary of Ferrari as well as the 50th Anniversary of the Maserati Ghibili. To book your visit to Concorso Italiano, visit concorso.com. 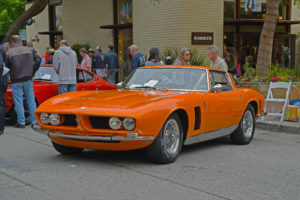 Strolling through downtown Carmel, Calif., you’ll be able to see the likes of this 1967 Iso Grifo. Make sure and have dinner in Carmel and walk through the downtown area one evening during the week. 4. Strolling Carmel-by-the-Sea – All these structured events take months of planning and registration to come to reality. For those more spontaneous visitors to Monterey Car Week, truly one of the things to behold is just cruising down Ocean Ave. in Carmel-by-the-Sea. The area also holds a Carmel-by-the-Sea Concours in the downtown area on Tuesday 15th, but it is a treat each night to comb through the downtown Carmel area. Each night, droves of one-off foreign and domestic classics and hyper cars venture through the city, one after the other. 5. Exotics on Cannery Row – Friday August 18th features one other pristine event, which is free to the public – Exotics on Cannery Row. This event will feature over 300 exotic and foreign hyper cars with over 19,000 enthusiasts in attendance. Located off of Cannery Row in Monterey, Calif., this event pits enthusiasts in an absolute breathtaking scenery, accompanied by absolutely sublime foreign exotic cars.